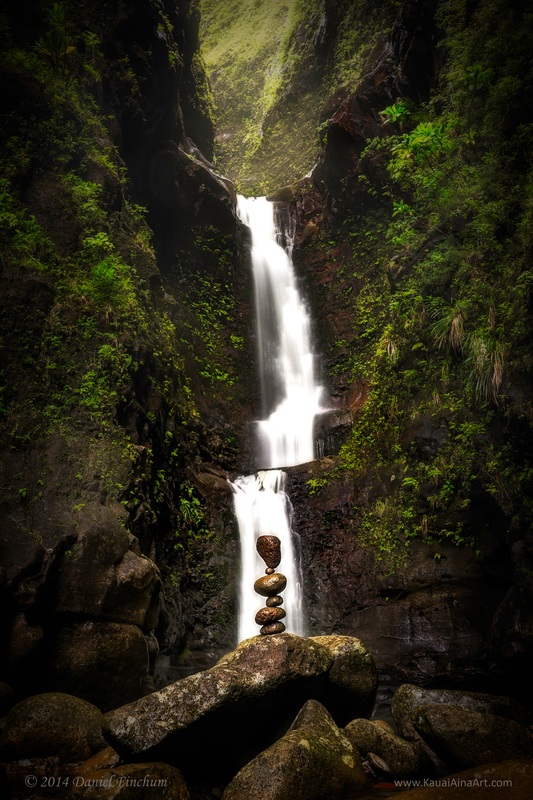 A simple balanced rock stack at lower lower Hoopii Falls with some very special light. The African Tulip flowers were about 15 feet to the left and randomly relocated around the stack. The title speaks for itself. Winner of a People's Choice Award - KSA Membership Show - Feb '15. 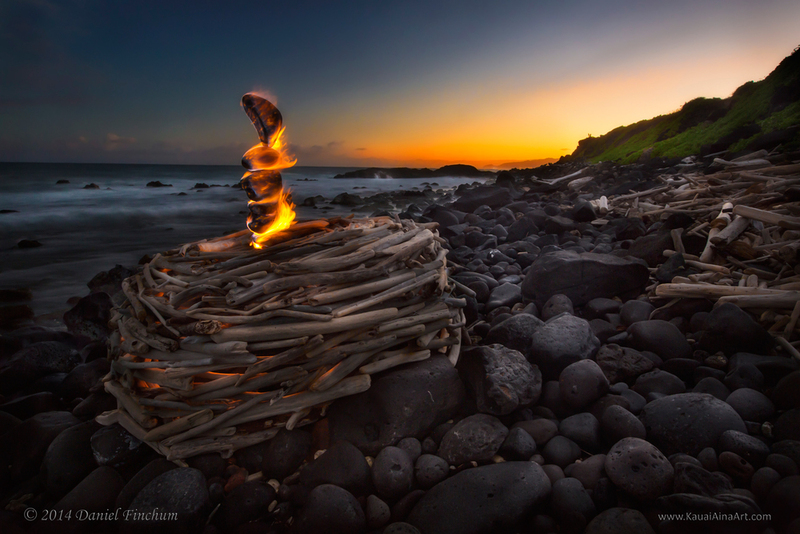 The Kealia river mouth is a source of thousands of washed up sticks and logs. The swirling in the ocean of these sticks and an image I had in the back of mind from some time ago reminded me of music. The flaming coconut was actually the suggestion of a passerby who suggested I set the whole thing on fire when finished. Taking my inspiration from the roots of this magnificent tree, I decided to emulate the pattern using stones. After working all day to make the sculpture, I spent the night with it to capture the rising sun’sillumination of it. The piece harkens stone wall building among the Polynesian peoples. I stumbled upon this tide pool that wasabout 20 feet above the water. How the water got in there I’m not sure, but it was probably rainwater. The ironwood needles all around and floating on the water inspired me to put my finger in the middle and form a circle, within a circle, within the larger half circle and loving “embrace” of Hanalei Bay. This stretch of rocky shoreline along the Kapaa bike path is often strewn with washed up sticks. After heavy rains in early 2014, I had plenty of material to work with in paying homage to the great land art sculpture and my early influence, Andy Goldsworthy. When I let one of my best friends name this picture, I was reminded of all the great memories we share of this beautiful place called Kalihiwai Bay when we were much younger. If you look carefully, you will see the nearby pencil urchins placed all over the stack. As always, everything is put back unharmed. While scouting the day before I was to work on a planned build, I saw a natural depression in this rock. With plenty of natural wild flowers nearby, the next day I picked some up on my way to the larger build and filled the depression providing a stark contrast between permanence and fragility. Part of a reflecting pool series, I chose to use the iconic triangle shape within kapa making to create my own design based on the seafaring nature of Hawaii’s people. The honu (turtle) in petroglyph style was sculpted with a trowel. As part of my Kahu series this little lopsided stack stands ready to protect the entry to NaPali. Part of my “Kahu” series, the sandstone rocks nearby allowed me to balance this stack in the most precarious of places… on the edge of a 20 foot cliff with waves splashing up between the small inlet. I actually had to end this shoot early as a larger wave did knock over the stack and my gear was slightly coated in sea water. Fortunately, no damage done. Part of my “Kahu” series, this B/W with the ascending shape of balanced stones stands stoic and alert to protect its lair. The stack was placed between two enormous boulders that had fallen off the cliffs above – this is not a cave. Kalihiwai point is known for its large winter surf, washed up boards, sharks, broken bones, and missing teeth. The foreboding look of this scene should serve as a reminder to always treat the ocean with upmost respect. Situated near the predominantly Hawaiian village of Anahola, the balanced stones symbolize the Kahili of a lost monarchy. The rhythm of the nearby Heliotrope and False Kamani trees coupled withdappled light shinning down through overhead branches reminded me of dance. What better dance to demonstrate the graceful curves and movement of this scene than hula? Creatednear Papaa Bay with sand, forest litter, coconuts, stones, and the nearby leaves of these trees. Lana Pua (floating blossom) was taken along the Hoopii river where the hau bush is plentiful. The hau blossom, an ancient symbol of the human soul, was ephemeral. Unfurling yellow in the morning, turning orange in the afternoon, and withering to a dark pinkish orange by nightfall, they are replaced daily. This location is extremely difficult to shoot. One of the few places on the north shore to capture a southern Milky Way shot. The water also had to be flat at low tide. Otherwise I would have gotten wet by the crashing waves. 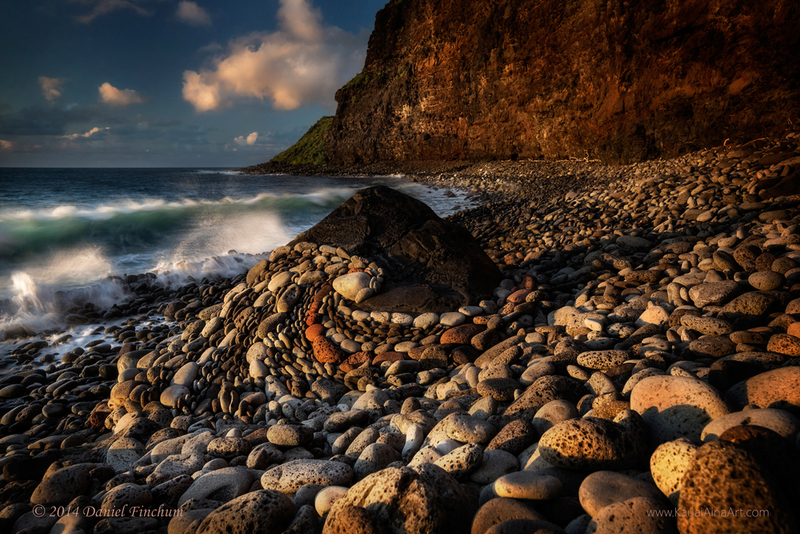 Near Queen’s Bath in Princeville, this has become a popular photog location. Aaron Feinberg probably has done it best. The stick and stone sculpture is inspired by another land artist, Bill Dan. The little rock on the right arm is balancing the entire piece. Perched precariously on its “toe” this rock reminds me of the graceful strength and balance of a ballerina. Although a little small, the opihi abundant upon these sea stones make for a tasty treat. This amazing stretch of stony coastline is filled with wonderfully smooth round and oval stones of varying color and size. Obviously shaped by the pounding surf through eons of time I was inspired to pay homage to this natural creative force. A balanced rock stack “erupting” from a simulated volcano of washed up sticks evokes ancient memories of a fiery beginning. This stick sculpture was one of my early pieces inspired by Andy Goldsworthy. I only added the rocks and fire. A differentview of the piece, “Memories of Pele” I captured later in the evening. It was so completely different in mood and spirit that I took the rare liberty of passing this off as another creation. Strewn along the shoreline, especially in this location, are dead bits of coral. We all know that our natural coral reefs are in danger of extinction. As a spear fisherman I see this first hand. This sculpture hopefully brings attention to this sad fact. The rays of sunshine offer hope that if we work together, we can save our precious reef. After a very long and difficult hike up Makale’a valley, these carefully arranged balancing rocks bring attention to the divine and the anthropomorphic. Most people photograph the surging tide pool right next to this location. I chose to shoot a full moon with hues of lavender light androck stack with its opposite reflection. Limu (sea weed and/or moss) always fascinates me with its lush texture and brilliant emeraldand sometimes brown color range. The balanced sculpture compliments the lacy feel of Secret Falls. In ancient Hawaiian times, this area known as Hauola with the adjacent oldest know heiau on Kauai, Hikinaakala, was a place of refuge for those who broke the rules of Aloha. These sand carved petroglyph replicasfound inscribed on the oft covered rocks, show the way to those needing protection. However, it must be said that it is not known for sure the purpose ofHawaiian petroglyphs. 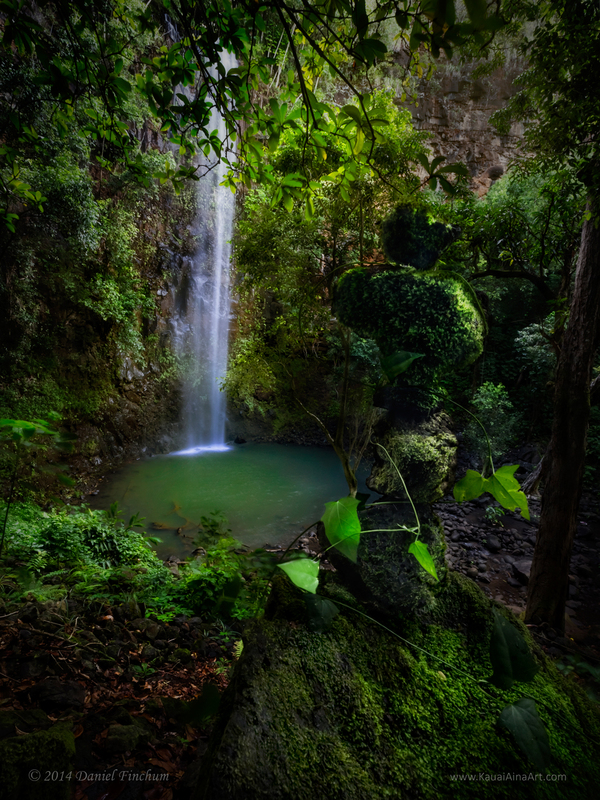 As part of my “Uapo” series, this rock sculpture consists of two bridges spanning a section of lower Ho’opi’i falls. These rocks are only held together by gravity and careful positioning. As part of my “Uapo” series, this early morning scene consists of three bridges made up primarily of dead reef bits. Rocks are used to support the arches. I spent the entire previous day building this structure only to find a quarter of it washed away the next morning. I spent about two hours in the dark prior to sun rise to get it back into shape. The tide won’t be this low for another year. Using a strong neutral density filter, I’m able to create super long exposures in mid-daylight. The result is a cloudy atmosphere on which sticks and stones seem to be floating. The many crescent and circular shapes in my frame inspired this ironwood needle arrangement. I was visited by wonderful light during the last few minutes before sunset. 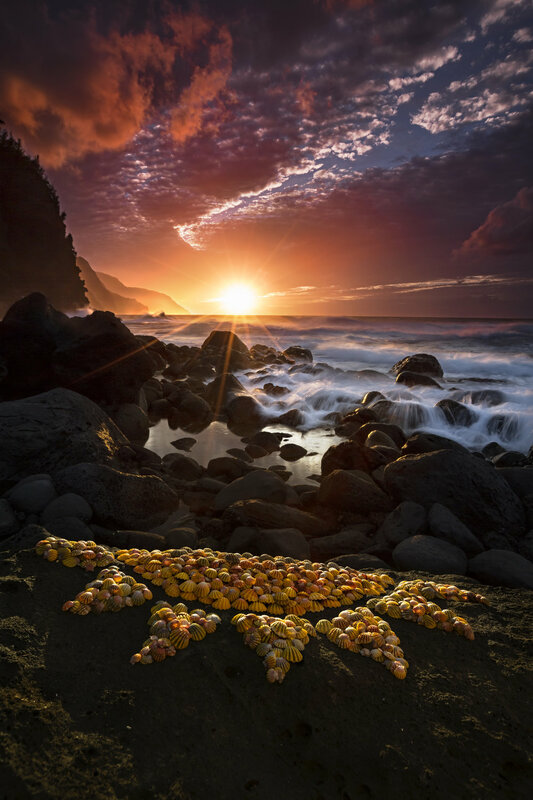 This image has become the logo for “Kauai Aina Art” for it is with stones I firstbegan the practice of “land art” or sometimes referred to as “environmental art”. It is a misnomer to call my art “installation art” due to its ephemerality. In the case of this sculpture, the wind puffed and my sculpture was no more shortly after I took the image. My good friend and "business partner" deals in jewelry and Hawaiiana and loaned me a bag of about 1000 sunrise shells and said, "Do something with these." Sunrise shells are only found in Hawaii and almost considered like currency. These shells can range from $10-30 or more. You do the math. :) Anyway it took me three attempts to do this piece each time taking between 5-7 hours to sort, arrange, and place each shell several layers ...high. The first time I did it, I didn't like the design. Went back a different day and I loved the design but I got rained out. Third time back was a charm as you see the results here. I just had to borrow a passing tourist to hold up my sorting board to keep the wind from blowing off the shells while I worked the camera. The title "Sunrise Sunset is borrowed from a famous song in "Fiddler on the Roof". It speaks of our life's cycle from birth to death. To create this image, it took me and my crew several days of hiking up and down with ropes a remote cliff to a sea cave at low tide. We built ten wood fire pits and using the nearby washed up drift wood we set them afire with flames reaching up to six feet. The arc of the fire pits is reminiscent of a pacific island chain forming as tectonic plates shift over time.